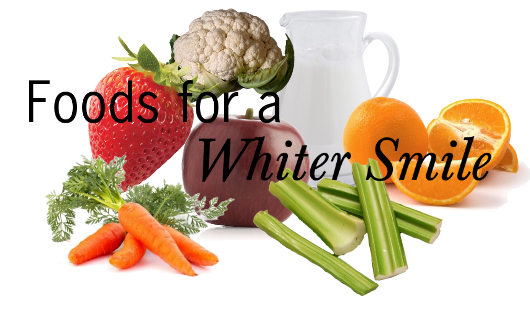 Foods That Help to Brighten Your Teeth! Strawberries – Berries have a bad reputation for staining teeth, but luckily, for strawberries anyway, this is just a myth! Strawberries contain malic acid, which is an enzyme that naturally works to remove discoloration and whiten teeth. Crunch-inducing produce – Cauliflower, carrots, apples and celery all have one thing in common — they are naturally abrasive! These foods scrub your teeth clean as you chew them! They also all have a high water content, which will increase the production of saliva that washes away bacteria and plaque. Oranges – Although oranges are acidic, which can be troublesome for your teeth, their acid contains enzymes that help to stamp out the bacteria that causes bad breath and tooth decay. Dairy – Your favorite dairy products, like milk, yogurt and hard cheese, contain lactic acid and calcium, both of which are beneficial for your teeth. Lactic acid will protect your teeth from decay, and calcium will help to strengthen your teeth and gums. Enjoy a brighter, whiter smile by sticking to a healthy diet full of the above foods. Feel free to contact us to learn more about our Free Whitening for Life program!